No matter what size of herd you manage, perhaps the most important management issue is getting cows pregnant with a minimum of expense or lost production due to unnecessary days open. Numerous studies and reports in recent years show Jerseys to be a leader in various aspects of reproductive performance. Jerseys mature earlier than other breeds and can be bred at a younger age and enter the milking herd sooner. Their average age at first service is an entire month younger than the industry average, and many producers are breeding their Jersey heifers by 12-13 months of age. Across their lifetime, Jerseys will average 3.3 calvings and experience 3.8 lactations. While all breeds can benefit from reducing their average age at first calving, it is reported that $920 of profit per cow could be realized if Jerseys calved at 22 months instead of the current breed average of 26 months. Of the top three breeds in Canada, Jerseys experienced the largest financial gain. Jerseys require fewer inseminations per pregnancy and have an average of 1.8 breedings per cow - the best value for this trait amongst all Canadian dairy breeds. They have a 56-Day Non-Return Rate of 68% - and that’s 7% better than the industry average. Further studies state that purebred Jersey heifers reach puberty eight weeks sooner than the industry average. Jersey heifers also have longer heat periods and more standing heat events and this can help detect estrus or alleviate the misdiagnosis of estrus which can be expensive. Jerseys have 1/3 fewer difficult births than the industry average, requiring less medical intervention, less worry, and the ability to get back-in-calf quickly. Supporting data from the Canadian Dairy Network indicates a 96% easy calving rate for Jersey heifers and 99% for Jersey cows. Whether it be their resilient nature, appealing calving ability or pregnancy success rate, the Jersey breed realizes lower than average annual veterinary and pharmaceutical expenses. If your goal is to build a herd of Jerseys with strong production and type traits, purchasing embryos from animals of high genetic merit may be a good option. Embryo transfer can speed up the genetic progress of the herd with profitable cows from strong pedigrees with the will to produce. It can also minimize disease from entering your herd and benefits your biosecurity procedures. 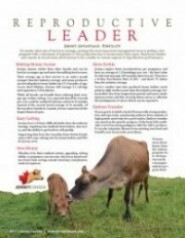 View or download our Reproductive Leader fact sheet.